Is to significantly expand communication between dolphins and humans. Develop new systems to explore cetacean cognition, acoustic abilities and create a language interface. Record cetacean sounds both above and below water in the broadest spectrum possible. Analyze these cetacean sounds for harmonic patterns and communication value. Use these analyzed sounds to play specific musical phrases and tones underwater -- back to the cetaceans -- while recording their contemporaneous responses. Publish and share this research in scientific journals. Assist in establishing new standards in the scientific grade recording and processing of marine mammal acoustics. Play cooperative games with cetaceans in order to expand our understanding of interspecies alliances and non-verbal communication. Produce and distribute dolphin recordings for integration into human culture. 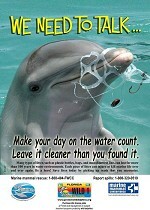 Use dolphin images and recordings to inspire humanity towards greater stewardship of our oceans.